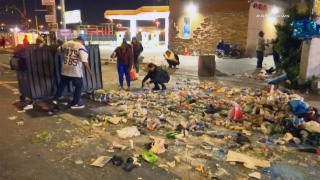 Volunteers and residents clean up after a chaotic night at a memorial Monday April 1, 2019 for rapper Nipsey Hussle. 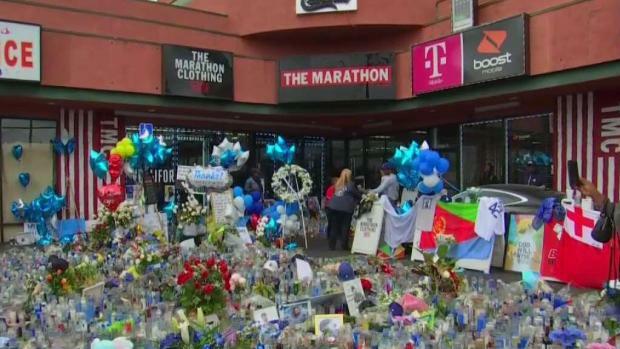 Los Angeles Police Department crime reports say two women were the victims of shootings at a vigil for Nipsey Hussle that happened at the same shopping center where the rapper was murdered a day earlier. The police data characterized the April 1 shootings as, "assault with a deadly weapon, aggravated assault," and listed the weapon used as an, "unknown firearm." Last week Chief Michel Moore suggested there had not been a shooting at the vigil, during which more than a dozen other people were injured as hundreds in the crowd suddenly ran from the site. "We had a commander on scene when this event unfolded that was 50 feet away from where the vigil was occurring, and we do not have any reported gunfire being heard," Moore told reporters at a news conference. People are still gathering at rapper Nipsey Hussle's store in South Los Angles. Jane Yamamoto reports for the NBC4 News at 6 p.m. on Friday, April 5, 2019. He said two women were later treated for gunshot wounds and claimed they'd been at the vigil. "Initially reported a different location and stated that they had been shot," Moore added. An LAPD gang detective said in a search warrant affidavit reviewed by NBC4 that the women heard, "loud bangs," and a, "loud, rapid succession of gunshots from an unknown direction," while attending the vigil. The victims were an 18-year-old woman and a 26-year-old woman, according to other LAPD documents obtained by NBC4. One of the women had been shot in the right lower back and buttocks and the other in the arm. The detective wrote in the affidavit, first reported by TMZ.com, that employees of the businesses in the shopping center where the murder and vigil shooting happened were uncooperative and had refused to provide security video to police. Based on personal knowledge, the detective said, " ... the shopping center ... is a known Rolling 60s Criminal Street Gang gathering location. The Marathon store is a known Rolling 60s Criminal Street Gang location." Hussle was killed March 31 while standing outside The Marathon, a store he owned. 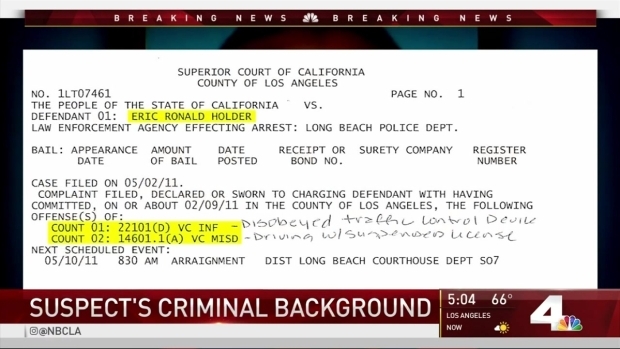 Prosecutors have charged an alleged gang member Eric Holder with the murder, though police have said the motive appeared to personal, rather than related to gang activity.